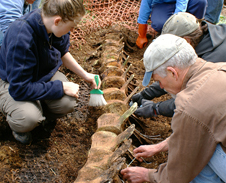 After CA189, (the female orca) stranded near Dungeness Spit in 2002, a necropsy was done, tissue samples were taken, the blubber and flesh were removed from her body and the remaining skeleton was covered with manure in a cow pasture in Sequim. She lay there, undisturbed by humans, for six years. Then, in 2008, a visitor casually mentioned the skeleton, wondering whether anyone had claimed it. Questions, emails and correspondence with NOAA bounced back and forth until we were given a long term loan of the skeleton for use in education. In May, 2008, PTMSC staff and our stalwart team of AmeriCorps joined a group of scientists and volunteers on the Sequim farm. The skeleton lay inside a bright orange net, covered with a thick growth of nettles and lush grass. We carefully uncovered the bones, labeled and tagged each one and loaded them on a truck bound for the NOAA lab in Seattle. There the bones were cataloged, soaked and cleaned of the cartilage and dried tissue that still remained. In March, 2009, we received the bones, and the real work for us began. See the pages below to follow the story of our work finishing the cleaning and whitening of the bones, making an orca bone atlas, and casting and painting new teeth that will be used in the articulated skeleton.